The Quakers’ Hole Community Wetland Project was originally conceived in 2003, as an undertaking designed to investigate, manage and enhance the wetlands whilst involving all facets of the local community. The overall aim of the project was to safeguard the future of the wetland and to contribute towards reversing the national decline in these important environments. A Local Heritage Initiative Grant was awarded, and the project achieved its goal, involving over 150 people from the local community and spanning 10 local organisations. 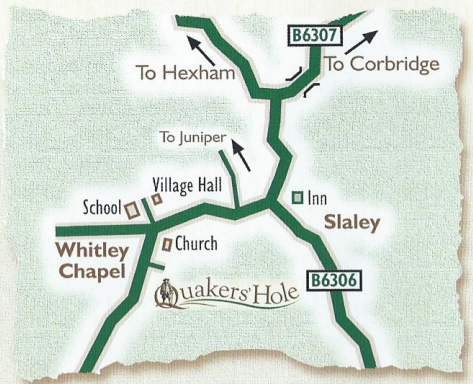 Quakers’ Hole is c 9 hectares of semi-natural wetland near Whitley Chapel, which is home to an amazing variety of flora and fauna. The site is leased to Hexhamshire Parish Council for a period of 99 years for a nominal fee of £1 pa. In the past the area has also been known as Quakers’ Hollow, thought to have derived from the fact that in the seventeenth century the Society of Friends (or Quakers) held their meetings on Chapel Hill to the north of the site, which is where St Helen’s Church now stands. The banks and fields surrounding the site lie on boulder clay, sand and gravel, but the wet ground in Quakers’ Hole is made of peat, (the rotten remains of plants that have built up over thousands of years). This peat acts like a giant sponge holding moisture in the ground and ensuring wet conditions all year round for the specially adapted plants and animals that can be found here. 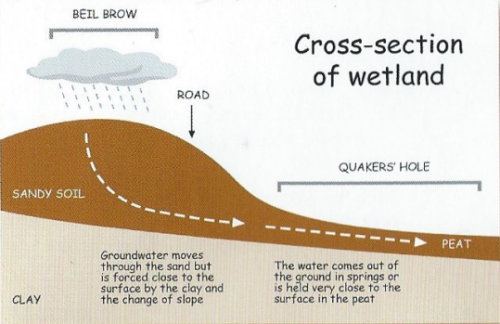 The site can be classified as a soligenous mire; the wetness of the ground being maintained by a slow lateral movement of water through the peat. All the water flowing through and across Quakers’ Hole eventually meets a stream flowing eastwards into the Devil’s Water. The wetlands provide a diverse and rich source of nutrition and habitats for breeding and visiting birds, including song thrush, starling, linnet, reed bunting, great partridge, kestrel, snipe, fieldfare and redwing. A birdhide is sited at the northern edge of the site, looking down into the natural hollow and is open throughout the year.